SINGAPORE (Dec 4): Central bankers are starting to see promising results from one of the recent additions to their monetary policy toolbox. Lending curbs to stem financial risk -- so-called macroprudential limits -- have helped slow risky borrowing and temper property price bubbles in countries from New Zealand to Canada, a host of financial stability reports showed this week. While there hasn’t been uniform success -- Hong Kong’s housing market shows no signs of cooling -- it’s given central banks some breathing space to be more gradual in tightening monetary policy. Asia-Pacific nations have recently been among the boldest in trying to curb the effects of ultra-easy monetary policies. In New Zealand, where tighter mortgage lending rules helped to curb soaring property costs, the central bank is now ready to reverse restrictions from Jan. 1, acting Governor Grant Spencer said Wednesday, adding that price pressures will continue to moderate. Macroprudential tools came of age in the aftermath of the financial crisis as central banks turned to them to cool markets without bludgeoning them and hurting overall economic growth with the blunt instrument of interest rates. The hope is, if successful, rates can be kept lower for longer to support the economy. Australia’s measures are biting, with a housing boom all but over as property prices in Sydney decline. The Reserve Bank of Australia sees tightening lending standards as necessary medicine that’s already making the balance sheets of banks and borrowers healthier, although a record debt overhang for households remains a worry. Risks in the housing market “have not gone away, but the fact that they are not building at the rate they have been is a positive development,” Reserve Bank of Australia Governor Philip Lowe said in a Nov. 21 speech. China is set to see the first decline in home sales since 2014, owing to interventions over the past year-and-a-half to cool the property market, including tighter down-payment requirements and restricting non-resident buyers. Officials are keeping up the enhanced rules, betting that they will help ensure the world’s No. 2 economy can manage a controlled cooling without triggering a growth slump. In Southeast Asia, Singapore earlier this year tweaked some property curbs that were meant to cool the market, helping reverse a housing slump. The Monetary Authority of Singapore, in its financial stability report released Thursday, said enhanced post-crisis restrictions on banks in South Korea and Hong Kong -- such as limits on cross-currency swaps -- helped reduce vulnerabilities in the region. Lending curbs have also won the backing of the Bank for International Settlements, which found in a September report that among 64 advanced and emerging economies, those that more frequently use the tools typically enjoy stronger and less volatile growth. The European Central Bank is doubling down on such measures, finding them especially handy to tackle the nuances of member economies. Germany’s Bundesbank said in its Nov. 28 finarncial stability review that even -- and perhaps especially -- in good times, central bankers should consider using the tools to curb complacency. “Owing to the prolonged period of sound economic development in Germany, the perception of risk in many quarters might be too positive at present,” the Bundesbank said. Germany already took action earlier this year to grant BaFin, its market regulator, the power to cap borrowers’ loan-to-value income ratios to limit defaults amid soaring property prices. The Bank of Canada is expressing a similar sentiment: property-market overheating and financial stability risks are being curbed amid higher mortgage rates and policy measures. Fewer highly indebted households are able to qualify for loans, ensuring the system will continue to build resiliency, the central bank projects. Global policy makers aren’t off the hook yet. 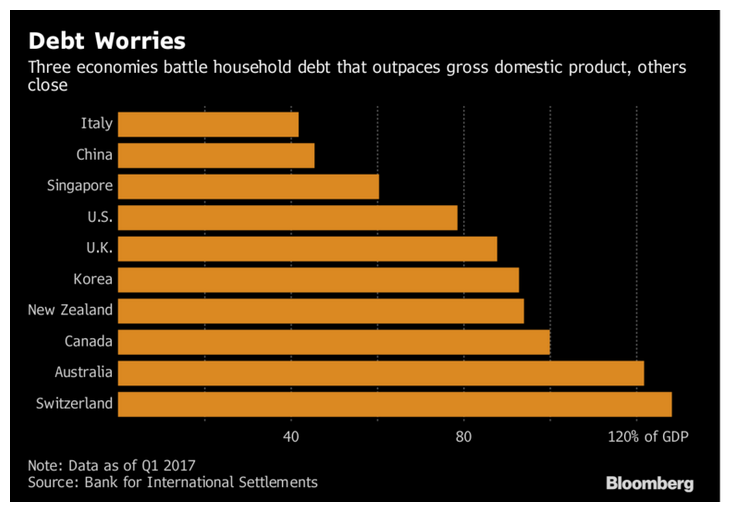 Stricter financing rules may have curbed excesses, but household debt remains high in many countries, say analysts at Citigroup Inc. The Swedish Financial Supervisory Authority said in its financial stability report Wednesday that housing and debt risks are still elevated, even though capital and lending requirements for banks have been raised for years in order to stem risk. Macroprudential measures also have their limitations, according to economists at Fitch Ratings Ltd.